Many of us are competent with other Moz Tools, but a tool that is perhaps not as spoken about is Followerwonk. Changing how digital marketers can manage their social media accounts for clients, the tool has a number of useful integrations that when used smartly, can make a great deal of difference. It can seem a complex tool at first, but it is really very easy to use once you understand the different aspects of it. To help you wrap your collective heads around it, we have some of the top basic tricks that you can do with Followerwonk. Attracting the correct followers to your account can often be the most time-consuming task for a social media manager. You may have a great idea of what your audience is, but aside from ensuring your tweets have the search visibility to be found by these individuals, it can be hard to unite your target audience with your channel. It can be frustrating seeing your following growing so slowly, but often this is simply because you are not reaching the right people. Moz’s bio search means you can type in key terms that you know your target audience will likely be using, and it’ll bring up a list of profiles that use these terms, either in their Twitter profile bio, or just in their tweets in general. 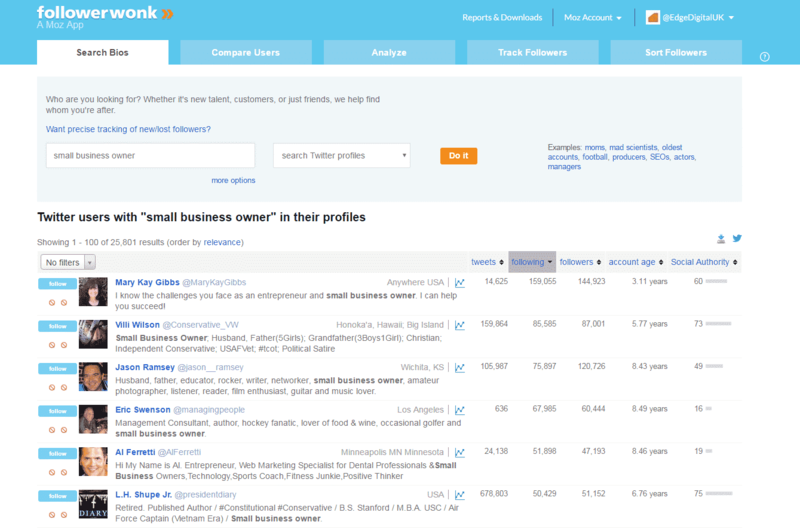 As well as finding your followers by key terms, you can search by location, and even job title. For example, if I am trying to get small business owners to follow an account on Twitter, there’s a decent chance a lot of these people will list themselves as a ‘small business owner’ on their profile. As you can see, once the tool gathers the information, you have a number of options to then filter the profiles you would like to see. Whether that is narrowing it down to those with a small or large following, the time their account has been active or their ‘social authority’ (estimating similar to how Domain Authority works, the status of that profile) there are a number of ways to find the right people with this tool. Of course, you may not want to hit the follow button on every single profile brought up, but out of the selection, there are bound to be a few potential leads on there, that if carefully looked after, could be a conversion, whether that is through engagement or following them and hoping for a follow back. 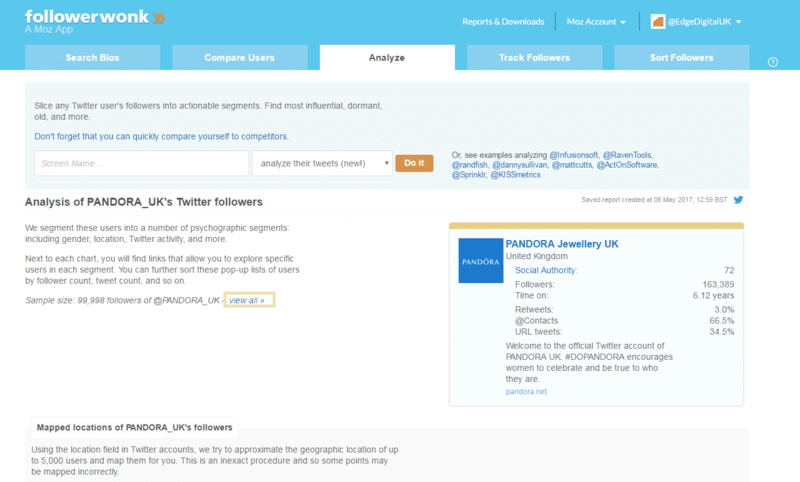 Probably a personal favourite out of the lot, the ‘analyse users’ tool means you can track who your competitors are following, and who are following them. This has worked wonders for me in the past, as it’s pretty to safe bet that if these profiles are following your competitor which does the same sort of thing as you do, then they are going to naturally want to know about you also, so there is the potential for a large gaining of followers. 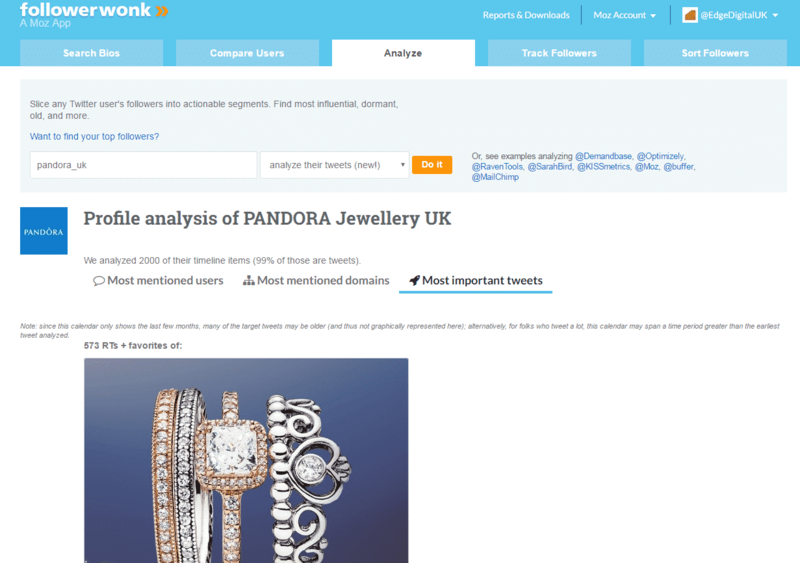 For example, if you’re a jewellery business looking to find jewellery lovers who may want to buy your products, the followers of industry giants such as Pandora are likely to be individuals who could be interested in you. Obviously, this can also be done manually on Twitter itself, but rather than having to scroll through hundreds of profiles, the filters in the tool means you can access certain followers instantly, by location, keywords they use, gender, age and much more, so you aren’t just viewing all the followers of a competitor profile. 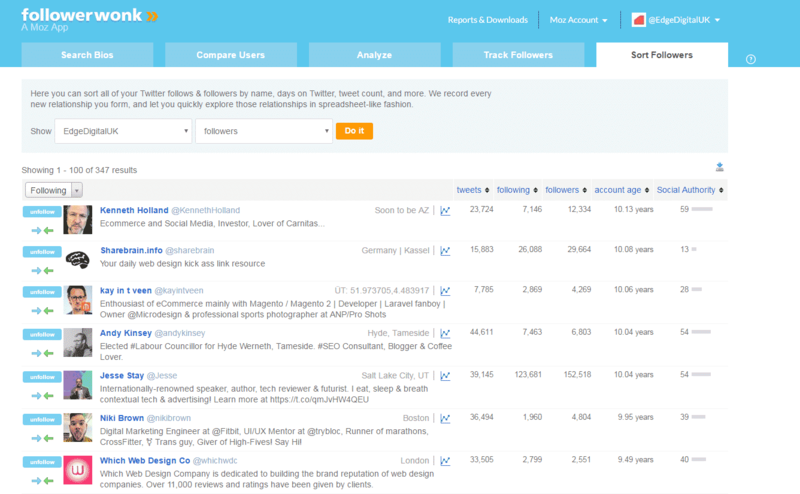 As well as analysing your competitor’s followers, you can also learn more about the competitor through the ‘analyse their tweets’ option, letting you see the most authoritative accounts that have mentioned them, and who they most commonly engage with. Seeing their most important tweets can also help you strategize your social media content better, by seeing what works well for your competitors and what you could be doing to to engage with a similar audience. A popular topic at the moment is ‘ghost followers’ being accounts that lay dead and inactive, often for unknown purposes, alongside the ever problematic spam accounts. Instead of having to crawl through your following to see what seems dodgy, Followerwonk’s ‘sort followers’ allows you to track through followers with filters, as well as being able to view only those who follow you back or who don’t. If you’re noticing your account news feed becoming cluttered of irrelevant accounts, you can also track through who you are following, to see there’s anyone worth unfollowing. Being able to maintain followers and following easily, through selected categories is definitely a worthwhile reason to utilise Followerwonk, especially if you manage profiles with a very large following. It’s all good and well doing social media effectively, but if you can’t see and understand the results to show your clients, there isn’t much point. Tracking progress of social media accounts can be difficult, as it’s harder to put figures and stats on than say, a website. 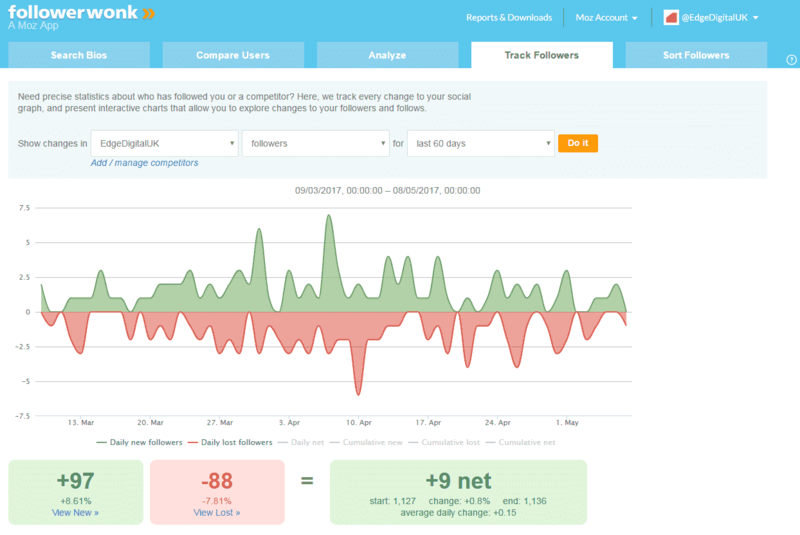 The track followers tool shows you easy-to-read graphs showing your growth (or decline) and followers you have lost and gained in a certain time period. It can be particularly interesting to see who you’ve lost, and it can raise vital questions as to why they’ve decided to go. This progress can all be put into reports as downloadable formats, so it will take no time at all to print off a report for a client and save you manually having to put together a table of information. For more even more details, if you analyse yourself against another profile in the analyse section, you’ll also be able to see the demographics and information of your followers. This can be really useful to uncover further who you should be reaching out too. You may think you know your audience, but after analysing the demographics you may realise it’s actually pretty different. Although not always necessary, it may be useful to sometimes be able to show your clients that their channels are doing better than those similar. This isn’t just saying ‘hey, we have more followers’ but could lead to being able to say ‘we are getting you more sales than X’. 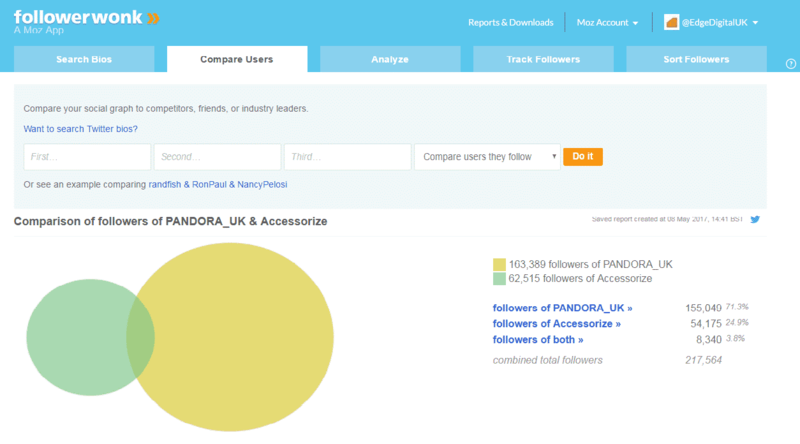 As shown in the example here, alongside being able to show you how much more or fewer followers you may have compared to a competitor, you can also see if you have any in common, giving you an important indication of the ‘common’ audience for your industry. Hunting for influencers and those who could maybe give you a retweet now and then to circulate your account, can be difficult. Manually finding influencers that don’t just have a large following but are also relevant and not already too popular to notice you, can take a long time. In the same way, you can use the search bios to find your potential followers, switching up the filters and searching for those with the highest social authority and the following can find potential influencers that can help your social media accounts grow. 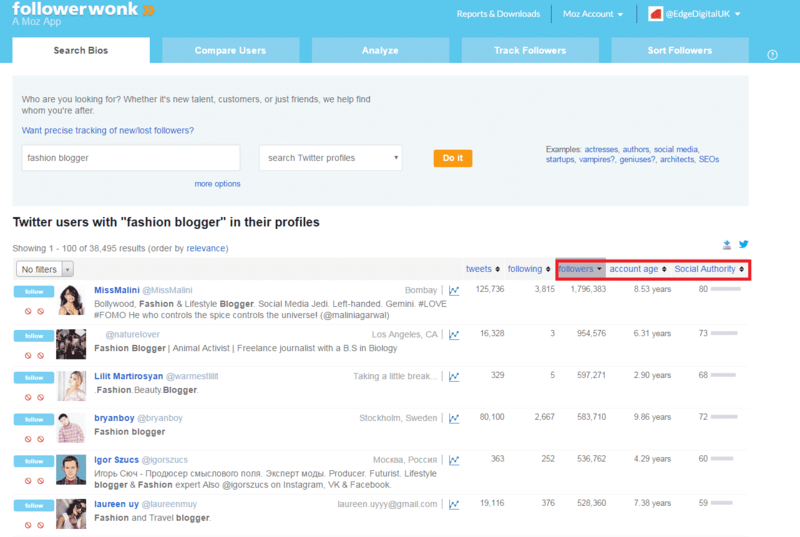 For example, if I am trying to find a relevant blogger for a client in the fashion industry, searching in the key term fashion blogger will allow me to see influencers with a large following in this sector. Not all of these profiles will be a suitable match for you, but it can definitely give you an indication of the kind of key terms you should perhaps be revising in your search for influencers who are relevant and appropriate. Followerwonk we are sure will continue to help social media enthusiasts enhance their social media accounts for some time. For more support on your social media campaign needs, contact the team at Edge today.